Like our regular wraps, Toufayan Gluten Free Wraps use only top quality, wholesome ingredients. They are naturally cholesterol free and trans fat free. True to the original traditions, we hearth bake each wrap to perfection so they are convenient and versatile.They are moist, delicious and nutritious, Toufayan Gluten Free Wraps are great for breakfast, lunch or afternoon snacking. I love your wraps. The only question I have is could you make them larger? I’d love to be able to get more into them without busting at the seams. If there’s ever an XL version I would absolutely buy them and I predict many others would too! Thanks again for the great GF products. Thank you for your interest in our Gluten-Free Wraps. We will definitely pass your message along to our bakers! II love tour wraps, all of them. However ,I can’t find Ashely or use by date on the packaging. Can you tell me where it is? Thank you. Hi Nita, thank you for your endorsement! It’s up to your grocer to add the date code. Usually printed on the bag near the bottom (opening side), or on a sticker. Gluten Free Wraps should be coded for 30 days. Can you explain this date a little more clearly. I bought some at our local grocery store on March 28 and the sticker on the package stated, sale by date which was April 1. Does this mean I only have days to eat these before they are bad? If so that don’t say much for my local Publix store. I eat the wraps because the gluten free bread is terrible but I have a feeling these are bad as the wraps have a funny odor to them. The date code is applied by your store manager. Toufayan Gluten Free Wraps have a 30 day shelf life. Please check with your grocer. You may be able to swap them out for a fresh package. Hurray for FreshCo Windsor, ON! They are carrying your wraps. Look for them in the freezer section. I used to have to drive to Detroit, MI Meijer’s to find them. Love the wraps but recently purchased two packages that were immediately stale. Heating them up did no good. I’ve had this happen before but I’m really dismayed by it. I purchased them both at Hannafords. We are sorry to hear about your experience. We hope you’ll try our Gluten-Free Wraps again. To help keep our Gluten-Free Wraps fresh and ready to eat we like to store them in a breadbox, or in the large shallow bowl that often holds onions in our kitchen. Make sure they are well-sealed with no air inside the package, and stored in a cool, dry place (above the fridge is too hot). We recommend that you don’t store them in the fridge, but if you do, remember that condensation will make them go stale, so consider double sealing them. Usually, we heat up each wrap on the stove top or for a few seconds in the microwave with a damp paper towel to increase pliability and bring out the flavor. We’ve been looking into more Gluten Free options, as we work out our best recipes, we’ll share them! Thanks for your interest, do you have any other suggestions? Just had the same experience. Came home 30 minutes ago with a pkg of the gluten free wraps…stale and falling apart as soon as i try to ”wrap” them around my chicken salad. Won’t buy these again Will stick with the low carb ones which have never been dry. Sorry for your experience. It’s very hard to get pliability out of gluten-free products. It’s the gluten that provides the flex. Heating up the wraps helps tremendously. Please just give them another try. Place wraps on a microwave-safe plate with slightly damp paper towels between each one and cook on high for about 30 seconds to one minute (or until warm throughout). Even if you serve them cold, the extra pliability from the warmth can make wrapping them easier and the heat brings out the flavor as well. I’m very interested in these products. However, while you list the nutritional information on your site, you do not list the ingredients. Thank you for your interest, Brad. Ingredients: water, modified food starch, rice flour, soy flour, dextrose, soybean oil, tomato blend (dried tomato, paprika, onion, garlic, air dried tomato, beet and basil), milled chia seed, yeast, contains 2% or less of the following: potato starch, xanthan gum, salt, rice starch, maltodextrin, polyglycerol esters of fatty acids (emulsifier), mono and diglycerides, fumaric acid, calcium propionate (to maintain freshness), baking powder (sodium acid pyrophosphate, sodium bicarbonate, corn starch, monocalcium phosphate). Ingredients: modified food starch, rice flour, water, sugar, potato starch, brown rice flour, millet flour, canola oil, tapioca flour, xanthan gum, contains 2% or less of the following: white chia seed, quinoa flour, teff flour, flax seed, cultured brown rice, amaranth flour, black chia seed, yeast, fumaric acid, baking powder (sodium acid pyrophosphate, sodium bicarbonate, corn starch, monocalcium phosphate), salt, citric acid, lactic acid, silica (processing aid). Ingredients: water, corn starch, tapioca starch, rice flour, soy flour, dextrose soybean oil, milled chia seed, yeast, contains 2% or less of the following: potato starch, xanthan gum, salt, rice starch, maltodextrin (derived from starch), polyglycerol esters of fatty acids (emulsifier), mono and diglycerides, fumaric acid, calcium propionate (to maintain freshness), baking powder. Ingredients: water, modified food starch, rice flour, soy flour, dextrose, soybean oil, vegetable blend, (spinach, parsley, red bell pepper, carrot, tomato, onion, shallot, garlic), milled chia seed, yeast, contains 2% or less of the following: potato starch, xanthan gum, salt, rice starch, maltodextrin, polyglycerol esters of fatty acids (emulsifier), mono and diglycerides, fumaric acid, calcium propionate (to maintain freshness), baking powder (sodium acid pyrophosphate, sodium bicarbonate, corn starch, monocalcium phosphate). I am new to these gluten free wraps and just opened a pack of the savory tomato wraps. In making a tuna wrap just now, the edges immediately broke off as I was folding them. Is this typical, are the wraps old or is there some method to keep them moister? Thanks. Hi Sue and thanks for giving us a try. Considering the nature of a Gluten-Free bread product, you will find that our Gluten-Free Wraps aren’t as soft and flexible as our Hearth Baked Wraps. To make up for this, we recommend that you apply heat (in the microwave with a slightly damp paper towel or over medium heat in a large pan with a little oil or butter until warmed) which will help to increase softness. Moisture helps to reduce crumbling. We’d love to share your recipe if you have any pictures or if you can give us a few details about how you made your enchiladas. In fact, now that you mention it, I know what I want for dinner tonight! What size diameter are these GF wraps? 12″? Toufayan Gluten-Free Wraps are approximately 9″ in diameter. I was so happy to find a gluten free flour tortilla-like product! i try to modify all my recipes so I can eat similar to what i fix for my family and these were EXCELLENT! They rolled up in a sandwich without breaking like other brands i’ve used. your product is really good! We’re happy to hear that you liked them! Thank you. We’d love to hear about your recipe too – maybe we can feature it here on the website. Do you have any pictures? Gluten free wraps are excellent…wish I could find them near my home, got mine initially at Meijer in Bowling Green Kentucky while visiting friends. Any suggestions? Don’t see where they have them in Illinois. Hello Linda and thank you for your interest. 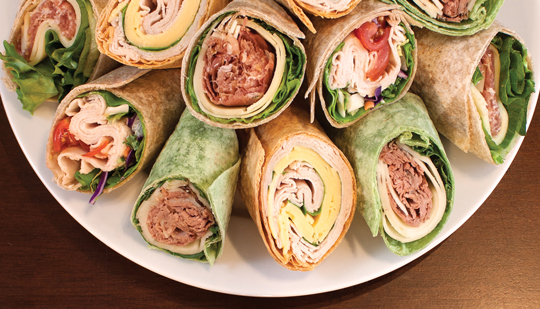 Please ask your favorite grocer to stock our Gluten-Free Wraps. Download or print a copy of our Gluten Free Product request form to make it easier for your store manager to order our gluten free products. If your grocer has trouble reaching us, you can have them call 1-800-328-7482 or ask them to visit our contact page. In Illinois, Some Plum Markets and Spartan Stores carry our Gluten-Free Wraps, but it is up to each store manager to decide what products and varieties they stock. Use our store finder for more details and areas. We tried these when we were traveling in FL last summer and they were wonderful. So, I was thrilled when I found them in Central NJ this week. Do you have any suggestions on how to best store them once opened? PS Any chance there will be GF Pitas in the near future? Hello Nancy, we’re glad you like them! We keep our wraps in the breadbox, or in the large shallow bowl that often holds onions in our kitchen. Make sure they are well-sealed with no air inside the package, and stored in a cool, dry place (above the fridge is too hot). We recommend that you don’t store them in the fridge, but if you do, remember that condensation will make them go stale, so consider double sealing them. I was able to have your gluten free wraps while I was on vacation in Florida! He only problem is that now that I’m home in Michigan I am on a mad hunt to find them again! Can I order them through your website, or are they available in stores somewhere near metro Detroit?! I’m on a macro specific prep and they are perfect, I need them! Hello Amanda, we’re glad to hear that you liked our Gluten-Free Wraps! Martins and Spartan Stores carry our Gluten-Free Wraps in Michigan. Many small chains in Michigan carry Toufayan products, and might be willing to order more products from us if you ask them. Download or print a copy of our Gluten Free Product request form to make it easier for your store manager to order our gluten free products. If your grocer has trouble reaching us, you can have them call 1-800-328-7482 or ask them to visit our contact page. They are available online, but not directly from our facility, so if you do order them from the web, please tell us about your experience, here. Let us know if you still need help looking or if you have any other questions. I’m sorry, but your gluten free wraps are pretty bad !!! Texture is strange, they crumble, and don’t taste good. and I wish I hadn’t. We’re really sorry you weren’t happy with them! Without gluten, the chewiness and the soft texture of bread products is very difficult to replicate using wholesome ingredients. We have found, just like our gluten-based products, if you apply heat you enhance the flavor and improve the texture. Try warming them in the microwave with a slightly damp paper towel. Or, fry them in a pan with oil or butter until they start to form air pockets or darken in color. Please give them a second chance and let us know how it went. Do your original gluten free wraps still contain eggs? I am seeing conflicting reports online. Thanks! Ingredients: Water, modified food starch, rice flour, soy flour, dextrose soybean oil, milled chia seed, yeast, contains 2% or less of the following: potato starch, xanthan gum, salt, rice starch, maltodextrin (derived from starch), polyglycerol esters of fatty acids (emulsifier), mono and diglycerides, fumaric acid, calcium propionate (to maintain freshness), baking powder. No eggs. You may enjoy safely. Toufayan Bakeries does not carry Gluten-Free Lavash at this time. However, we are working on bringing this to you as soon as possible. Please check back regularly to see if it becomes available. Currently, we offer Gluten Free Wraps and Gluten Free Pita Chips. Learn more about our Gluten Free products. Also, allow me to address your other concerns, with a little explanation. Toufayan Bakeries ships mainly to distributors who in turn ship to your local supermarkets. We are first and foremost a bakery and therefore our facilities are not set up to ship individual cases or smaller orders across the nation. We rely on local distributors. Our website does not serve as an ecommerce platform, this is a place for product information, recipe suggestions, new product announcements, community news and customer feedback and reviews. You may find a map of the country on our where to buy page. From there you can click on a state to see a list of stores in your region that are part of our distributor’s reach. It is up to each individual store manager to stock Toufayan products or not, but those grocers listed on our where to buy page already have the availability to stock our products. If you are interested in any of our products, please ask your favorite grocer to add them to their inventories or to contact us directly. why can’t I seem to find a list of ingredients for any of the products? Thank you for your interest, Gina. I was reading through ingredients to see if these are vegan and noticed on your March 28th post the original gluten free you stated NO EGG enjoy to someone however this post states EGG. I don’t see any animal products listed on the spinach gluten free but now I’m concerned that perhaps I missed something? Can you clarify? Sorry if we weren’t clear: Gluten-Free Original Flavored wraps contain NO eggs. Due to popular demand, our bakers created a recipe that contains no eggs. That post listed ingredients from older packaging. At least for the past couple of years we haven’t used eggs in our Gluten Free Original Wraps. Please enjoy them in confidence. Thanks for pointing out our type-o, we corrected it below to avoid any confusion. i own a gluten free store in northern ontario and want to carry your GF wraps. My distributer doeant carry it unfortunately. Can you advise how id be able to purhase wholesale? They are the ONLY gf wrap worth carrying. Hello Pete and thank you for your interest. Unfortunately we do not currently work with a distributor in your area. Please use our contact page. to reach a representative directly so we can try to find a solution for you. i just saw your gluten free wraps at General Foods Supermarket in Ocho Rios JAMAICA.. and decided to look you up before buying…im even more excited to try them since reading all the comments on this page! Thanks for your interest, Maria. The sell by date of our Gluten Free Wraps is meant to be coded by your grocer. We recommend that the re-seller code these wraps with a 30 day shelf life. Sometimes these wraps are frozen for shipping and once thawed the 30 day expiration begins. You do not need to refrigerate opened packages, though we do recommend ensuring a good seal. Store in a cool, dry area (on top of the fridge or toaster is usually too warm!) A bread basket on my kitchen counter works just fine in our home. It is acceptable to freeze these wraps to extend their shelf life, however once defrosted you should use them immediately and not refreeze. When freezing products, remember to use an airtight container with as much air removed as possible and try to reach the frozen state as quickly as possible by first chilling in the refrigerator for up to 2 hours, in a sealed package, before moving to the freezer. I purchased two packs of wraps dated 09/22. Today is 09/29, these have been refrigerated, are they still OK to eat? Also, this package has not been opened. Thanks for the countless packages I’ve purchased in the past! Fantastic product! We recommend that our Gluten-Free Wraps are marked for a 30 day shelf life after defrost. However, I have found that unopened packages often last much longer. Refrigerating the package doesn’t noticeably extend their shelf life, and we do warn against introducing moisture through condensation. Long before the Gluten-Free Wraps spoil, you will find that they become stale. Honestly, at that point I find them a little more pliable and easy to work with, though the flavor suffers dramatically. Some gluten-free tortilla chip recipes call for stale wraps. So, while they are most certainly still safe to eat, they might not be as delicious as they were a few days ago. Let us know what you think. You can see the ingredients of our Gluten Free wraps above – no dairy. You can enjoy them safely. Also, enjoy our Gluten Free Scoop-Able Pita Chips, which are dairy free. *Tip: products that are certified Kosher, will have the kosher symbol on the front. If the product contains any dairy products (including eggs), the kosher designation will be “dairy”. Products with the pareve kosher symbol do not contain any dairy. Thanks for your comment, Connie! We would love it if you could share any tips or tricks you use with our community. A recipe or picture would be most welcome as well! Do you use any special hardware or ingredients? I’m very disappointed in your gluten free spinach wraps. I have always loved your wraps but have new diagnosis of celiac disease so I can’t eat the regular wraps. They cracked and fell apart. I tried all the tips in your posts. So I’ll just have to do without. Sorry I was a hoping. Still use regular wraps for my family. Thanks so much for your love and we’re sorry to hear the wraps aren’t holding up for you. We’ve looked into so many ways to emulate the flexibility of gluten. We’ll keep bringing suggestions to the bakers! Meanwhile, I do have one or two more suggestions to try. Since gluten allows bread to stretch, without it the wraps will become much harder to work with. A fair replacement for gluten is pectin (the plant-based version of gluten) or collagen (protein version). Brush both sides of our Gluten Free wrap with butter, oil or lard and cook in a skillet or frying pan for a few seconds per side, or until lightly browned. Fry each wrap for about 10-30 seconds per side, until browned. The wrap should become softer and more pliable. Place the hot wrap on a plate or tray lined with two sheets of paper towel and cover with two more sheets. Place the next wrap on top, and continue the process. For me, it’s certainly worth the extra effort. When my doctor says I can’t eat some of my favorite foods, I’ll start looking for a healthier way to recreate that food, rather than go without it! If you are willing to give it one more shot, and you still don’t like how they come out, please don’t hesitate to contact us and let us know how it turned out! Rest assured that any Mono-and-Diglycerides used by our bakers in any of our products are purely vegetable-based. Thanks again for your question and enjoy! Who distributes your product in Ontario? I’m a retailer looking to buy your gluten free wraps wholesale to resell in our store. Thanks! Hello Jeff and thank you for your interest. We don’t have steady distribution in Canada yet, but we are working on it! Please contact us directly, via +18003287482 or email info@toufayan.com and we’ll put you in touch with someone who can help you. Jeff, I hope that you are able to stock the wraps as I also live in Ontario and cannot find them anywhere, other than one small store that has frozen ones. Toufayan, can you not find a distributor here? Loblaws used to stock your wraps but they have not had any for a long time. The Bakery Manager says that the supply is irregular so they cannot stock it. They are excellent but impossible to find! Thanks Nora, for the lead! We’ll have someone look into distributors in Ontario and reach out to Loblaws as well! I buy them at Wiarton Foodland. Could possibly talk to manager there for source. Please ask your store manager for the name of their distributor. We’d appreciate it! If you still want help finding Toufayan Gluten-Free Wraps, please contact us directly. I was recently diagnose with Celiac Disease, I was depressed. I tried many breads and none of them I liked so far. I came across your wraps while walking through the deli section of the grocery store. I swear I heard ahhhhhhhh and the display was shinning from the lights above when I spotted them. I was excited to try it and I loved it so much. I now make sure to have it in stock at home. I have also tried the other kinds of wraps and the garden vegetable it my favorite. Hello Kelly and thanks for your interest! If you are in Indiana, you can try Meijer or Spartan Stores, both carry our Gluten Free Wraps. Please ask your favorite grocer to carry our Gluten-Free Products. Here is a form you can give them to make it easier. They can call 1-800-328-7428 or visit our contact page. You can look for Toufayan Gluten Wraps online, try directeats.com or amazon.com. Other online retailers carry our products as well, though we have no direct partnership with any online stores. If you do purchase Toufayan products online, please leave a comment here to let our community know about your experience! Check out our Gluten Free Pita Chips for some scoop-able goodness. Oh, and if you have a sweet tooth, don’t miss, Goodie Girl Cookies! Some of the most delicious cookies you’ll ever find – you won’t believe they’re all Gluten Free. Feel free to let us know if you still have trouble finding Gluten Free wraps in your area, or contact us directly at info@toufayan.com. I have been struggling with my Celiac diagnosis, I cried for days, silly maybe, but my breads and pastas and wraps! What was I going to do? I found a decent bread, I came across an ok pasta, but never a wrap. I was crushed! Until today ….. while shopping at fresh co I spotted “gluten free” and “wrap” out of the corner of my eye, I took a peek and bought all 3 of your wraps! I’m stuffing my face as we speak! Thank you for shining some light on my new eating experience. I’m forever grateful!!! That’s so great to hear, Katy, enjoy! We’ll be working on other Gluten Free products in the future too! Look for our Gluten Free pita chips (psst, you can use GF Salted Caramel Pita Chips to make pie crusts instead of graham crackers, or make quesadilla with the wraps). Check out our recipe page for some great meals and look for gluten free focused recipes in the near future. Oh, and if you have a sweet tooth, don’t miss, Goodie Girl Cookies! Some of the most delicious cookies you’ll ever find – you won’t believe they’re all Gluten Free. I bought these wraps because my daughter has a gluten sensitivity when she refused to eat them i didn’t want to throw them a way so i tried to make use of them. .I found these wraps to be incredibly frustrating. I could live with the lack of flavor but the structural weakness was to much no mater what i tried to wrap in them they fell apart and made a mess i eventually gave up and feed the last 2 pack to my chickens, on the plus side my chickens loved them . I would not recommend them at all. I’ve found that if you heat up the Gluten Free wraps it makes them much more pliable. A slightly moist paper towel between each wrap, on a microwave safe plate, heated on high for about 40 seconds works well. Without gluten there isn’t much to hold it together so the warmer it is the less brittle it becomes. Even in the image above you can see some tearing where we wrapped them tighter, but a little water and some heat is all you need. For further flexibility add a thin layer of spreadable fat like mayo, oil, butter or similar on the inside. Personally, I prefer the Spinach variety, not just because they are green but they seem a little easier to fold too. Won’t you give us one more chance? Thanks for your feedback. Whatever you decide, we hope you and your family find something that works well and tastes good! Hi we live in georgetown ontario. Near toronto. We found your gluten free wraps on a trip and both my wife and daughter, who are celiac, love them. Far better than anything else out there. Is there a retailer in my area that sells them? Our Gluten-Free Wraps are not available throughout Canada yet. We are working with Canadian Bakers to bring our products to you. Meanwhile, you can facilitate the process by asking your grocer to carry our Gluten-Free Products. Here is a form you can give them to make it easier. Or, ask them to call 1-800-328-7428 or visit our contact page. You can look for Toufayan Gluten Wraps online, try directeats.com, amazon.com and MeyersGlutenFree.com (other Canadians have recommended this site for our products). If you do use any of these websites, please let us know about your experience so we can share it with our community. We look forward to hearing about the outcome of your search! My wife about died and went to heaven when we found your gluten free wraps. She has been gluten free for years now and have not been able to find a suitable tortilla. Then at Wal-Mart we discovered your fabulous creation. It was short lived though. Our Wal-Mart’s have discontinued your product. Luckily I purchased the last 6 bags before they discontinued it. However now she is saving the last couple she has for a special occasion knowing we can not find them anywhere in town any more. Wish there was other ways to purchase your product. Thank you for your interest, Kaalub, we hope we can help your any your wife find some more Gluten Free wraps! Help us to convince Walmart that they should restock Toufayan Gluten Free Wraps! Please help by going to corporate.walmart.com to leave a comment or call them directly at 1-800-925-6278. Ask your favorite grocer to carry our Gluten Free Wraps! Download a copy of our Gluten Free Product request form to make it easier for your store manager to order our gluten free products. If your grocer is still having trouble reaching us, you can have them call us at 1-800-328-7482 or ask them to visit our contact page. If you are in New Jersey, you can try Fairway, Foodtown, Kings, ShopRite, Wegman’s or Weis. You can use our store finder for more details and areas. Let us know if you find it somewhere else in your area, if still need help looking or if you have any other questions. Love your wraps but I’ve been disappointed that the diameter size has been reduced so much. Used to be just 1 or 2 per package that were smaller, but now all 6 are. They were the perfect size before. Please go back! Thanks. We’re disappointed to hear that! As you know, our hearth baked wraps aren’t machine-made so they all come out a little different. However, they shouldn’t be smaller! Can you tell us what store you purchased them from, or the lot number from the UPC? We love to hear your feedback so we can improve our quality control! Please feel free to contact a representative at info@toufayan.com, we’d appreciate any help you can give us. Hi, what is the best way to keep the wraps fresh once opened? And can you store them in the freezer? We recommend that you store our Hearth Baked Wraps in a cool dry place, room temperature is usually fine. Avoid storing bread on top of the refrigerator, because that area is usually warmer than the rest of your kitchen. Some people prefer to store bread in the fridge. That’s fine, just make sure that the bag is well-sealed. I use a gallon-sized storage bag and just place the packaging whole inside the bag. If you do keep it chilled, we recommend a short spin in the microwave before serving (on a microwave safe plate, cover the each wrap with a slightly damp paper towel and microwave on high for 20-30 seconds). I just bought the gluten free wraps in Montego Bay Jamaica. I’ve never seen them in my area. Can I purchase anywhere in St. Louis, MO? Or order online? Some of our customers have been able to find Gluten Free Wraps online, at various third party markets. 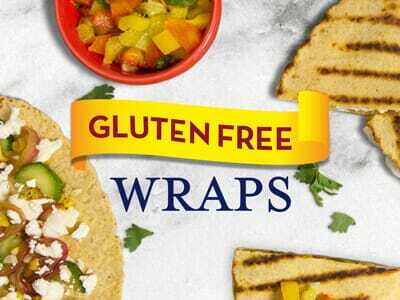 There are a number of grocers in your area that carry Gluten Free Wraps, including Hy-Vee, Balls Food Stores, Cosentino’s Market, Harps and Walmart. While some Walmarts have stopped carrying our Gluten Free Wraps, others still stock them. You can use our store finder for more details. Please ask your favorite grocer to carry our Gluten Free Wraps! You can download a copy of our Gluten Free Product request form to make it easier for your store manager to order our gluten free products. If your grocer is still having trouble reaching us, you can have them call 1-800-328-7482 or ask them to visit our contact page. Please let us know if you still have any trouble! Every Walmart in my area had these but then stoped keeping them wonder why? Please help us to convince Walmart that they should restock our Gluten Free Wraps! You can help by going to corporate.walmart.com to leave a comment or call them directly at 1-800-925-6278. Meanwhile, let us know if you find it somewhere else in your area, if still need help looking or if you have any other questions. I live in yardley Pennsylvania. I asked my local supermarket ( McCafrreys) to order the gluten free wraps ( they carry the regular ) and they said they are not available to them. Why? There are a number of grocers in your area that carry Gluten Free Wraps, including Foodtown, Shop Rite, Wegmans and Weis. You can use our store finder for more details. A very special dinner, completely gluten-free!